Apple is facing yet another lawsuit, but this time it’s not over smartphone patents, tablet designs, or any of the other myriad issues that boost billable hours for the company’s legal counsel. At stake in this legal dispute is cold, hard cash, and the plaintiff is one of Apple’s own shareholders. Specifically, the fund’s managers want the folks in Cupertino to distribute a larger chunk of their $130 billion cash hoard to shareholders using what's called perpetual preferred stock (more about that below), partly in the hope that a higher return will prop up the share price, since it will increase the stock’s value to prospective investors. Greenlight’s legal fight with Apple involves matters of corporate governance likely to make the average user’s eyes glaze over. Still, the dispute is interesting for a number of reasons, not the least of which is that it comes right before the company’s yearly shareholder meeting, which will take place in Cupertino on February 27, a time when the entire board of directors—including CEO Tim Cook—is up for reelection. And while the case may not directly affect Mac, iPhone, and iPad users, its impact could be felt in other ways—so much so that it’s worth reviewing exactly what’s at issue here. All public corporations parcel out their ownership in the form of shares, with each share representing an equal amount of rights and responsibilities for its holder. This common stock puts everyone on the same level, granting them ownership of a portion of the company’s capital and all the privileges that come with it, including the rights to attend stockholder meetings and to vote in board elections and on resolutions brought forth by other shareholders or by the board itself. A company can also issue preferred stock; as the name implies, these shares take precedence over common stock shares in several ways: Typically, preferred shareholders may be guaranteed that they will be paid a specific dividend, or that they will be paid out first in the event that the company goes bankrupt. In exchange, they may be asked to give up voting rights, making them passive participants in the company’s future in exchange for holding on to their shares and cashing in on the dividends. Why issue preferred stock? Typically, it’s done for two reasons. The first is to raise capital without diluting the power of existing shareholders; again, the preferred shares can be issued without voting rights in exchange for a guaranteed dividend. A company may prefer to issue preferred stock instead of bonds) for a number of reasons. For one thing, since a bond is essentially a loan made to the corporation that must be repaid within a fixed maturity period, the company’s credit record can suffer and other nasty complications—including bankruptcy—can ensue if the company doesn’t have the cash it needs to repay its bondholders. Preferred stock, on the other hand, doesn’t need to have a specific redemption date; the company can usually buy back the preferred stock (if it wants to) whenever it’s convenient to do so, rather than on a fixed schedule. The second reason a company might want to create a preferred class of shares is to enact a shareholder rights plan. More commonly referred to as a poison pill, this technique allows the board of a corporation to issue preferred shares at a discount to some existing shareholders when someone attempts a takeover of the company. The entity attempting the takeover is thus excluded from the right to purchase the new preferred shares, making it hard to complete the takeover without the board’s assistance. It’s clear that neither of these circumstances fits Apple’s current corporate needs. With more than $100 billion in liquid assets, the company doesn’t really need more money, and its market capitalization of more than $400 billion makes it unlikely that anyone (except maybe one or two intergalactic supervillains) would be able to launch a successful takeover attempt. Yet, Apple’s charter includes a provision that authorizes the company’s board of directors to issue preferred stock at will—something called a blank check, because the board can act without having to first seek the approval of existing shareholders. And, according to the board, this provision—a remnant of a time when the company might have needed quick access to more funds or to protect itself from a hostile takeover—is against the interest of current shareholders. Thus, the board is asking shareholders to strike the blank-check provision from the company’s charter during its upcoming annual meeting. Crucially, the same proposal also asks shareholders to modify the charter in two more ways; the first affects the way the board’s directors are elected, and the second assigns a nominal value to each share—a move that could provide the company with a number of tax and legal advantages in several jurisdictions. Greenlight’s management is obviously unhappy with the pace at which Apple has been doling out dividends, and wants the company to accelerate the payout rate by issuing perpetual preferred stock. This kind of stock would be issued gratis to existing shareholders; it would come with a fixed dividend, which the fund pegs at 4 percent; and it would not carry a specific redemption date on which the company could force its holders to sell their shares back to it. Because the new preferred stock would be tradeable just like any other stock, Greenlight’s reasoning is that it would very quickly take on significant value at a relatively low cost to existing shareholders. After all, a preferred stock that carries a fixed dividend backed by a company of Apple’s size and prestige is as close to a sure thing as you can get these days, and it’s likely that its price would very quickly outpace the amount of money that the company would have to pay out in order to meet its dividend obligations, unlocking—in Greenlight’s words—a significant amount of value for those who already own Apple’s stock. As things stand now, Apple’s board could enact Greenlight’s plan without having to seek the approval of all shareholders; if, however, the charter is modified at the upcoming annual meeting, it would be much harder (and probably more expensive) for the company to issue preferred shares, because it would have to take a vote of all common stockowners before doing so. And this brings us to the lawsuit at hand, which, ironically, has nothing to do with preferred shares—at least not directly. Greenlight claims that the proposal put forth by Apple’s board runs afoul of the law by grouping together three different matters—the elimination of preferred shares from the charter, the changes to the way board members are elected, and the assignment of a nominal value to common stock—into a single vote, thus making it harder for opponents of one measure to make their views heard. As an example, the fund points out that it supports the issues related to the board and to share value, and yet it cannot vote in favor of them because its management is squarely against the disappearance of preferred shares. For its part, Apple has issued a statement in which it claims that its proposal does not prevent the creation of preferred stock, but simply requires a shareholders’ vote to do so. Thus, the change is to the benefit of all common shareholders, who would be directly affected by the existence of preferred stock and who therefore deserve a say in whether the company issues it or not. Implicitly, the company’s position seems to also be that the proposal does not need to be unbundled because it pertains to a single action—changing the wording in its charter—and not three different ones. It will be up to U.S. District Judge Richard Sullivan to decide who’s right on the technical question of whether the proposal meets regulatory requirements—and, ultimately, up to the shareholders themselves as far as the underlying issues are concerned. 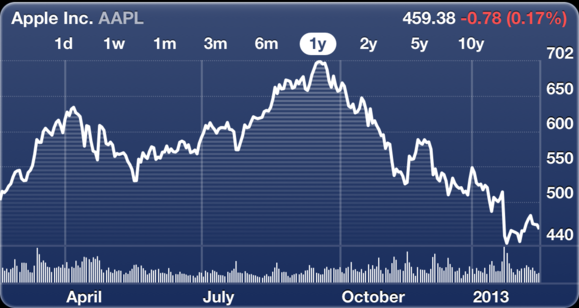 Nevertheless, it seems that the financial community is no longer as happy about Apple as it once was. This lawsuit feels like an opening salvo of a battle that could pit activist investors against the company’s management and possibly distract Apple’s brain trust from its central focus of helping to create the hardware and software that we all love. Still, there is no need to panic—yet. Just last week at the 2013 Goldman Sachs conference, Tim Cook dismissed the legal action as a “silly slideshow” (adding, however, that Greenlight’s proposal is “creative”) and reiterated that the company’s goal remains, as ever, to make great products. We’ll all have to see how that plays out next week, when the stockholders have their say.